CEDAR CITY — The results of a 2015 study by Libertas Institute of the 50 freest cities in Utah has prompted Cedar City leaders to change its firearm ordinance in three sections to come into compliance with state law. The ordinance amendments were presented during the regularly scheduled City Council meeting on March 2, and the council will vote on the changes following a public hearing in Council Chambers this upcoming Wednesday. Councilman Paul Cozzens first brought the infraction to the attention of City Attorney Paul Bittmenn after the Libertas study was released in November. The study examined the 50 most populated cities in Utah and considered three categories when making its determinations for how the cities ranked in regards to freedom for its citizens: individual liberty, private property rights and free markets. On a scale of 1 to 50, with one being the most free and 50 being the least free, Cedar City ranked 15th overall on the list. Heber City came in first, and Salt Lake City placed last. Since being presented with this information, Bittmenn redrafted the parts of the firearm ordinance that were out of sync with state and federal laws. Two of the three sections to be changed, 27-2 and 27a-7, impact concealed carry weapons permit holders and the ability to discharge a firearm within city limits in cases of self-defense. The third section, 3-11-1b, which deals with how the city may conduct itself during a riot, will change in verbiage only. All three sections were mentioned in the Freest Cities study for reasons why Cedar City ranked 47th out of 50 cities in Utah for gun regulation, one of nine metrics considered under the “individual liberty” category of the study. Under authority granted from state law, Cedar City has chosen to regulate the discharge of firearms in city limits with no exceptions for self-defense or other lawful uses made explicit in code. The city’s law also has additional provisions regulating firearms that may be inconsistent with state and federal law. Two such provisions mentioned by the study included the fact that under the current ordinance, the mayor may close stores selling firearms in emergency situations and possession of firearms in parks is prohibited. 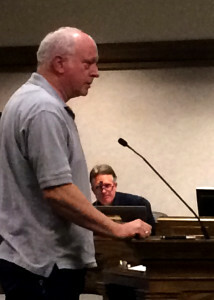 Using the spreadsheet provided by Libertas Institute for ranking calculations, Cozzen’s son, computer programmer Brian Cozzens, calculated that by addressing these specific gun regulations, Cedar City would move to No. 9 in the rankings, providing all other statistics have not changed in the other 49 cities evaluated. Brian Cozzen’s calculation was absolutely correct, said Josh Daniels, policy analyst in charge of the Freest Cities project. “The reason that is, is because Cedar City had some goofy specific regulations that made them an outlier,” Daniels said, adding that the study magnifies the effect of an outlier. Statistically speaking, an “outlier” is an observation outside of the expected normal range of values. However, for Councilman Cozzens, it wasn’t just about changing their outlier status. A city ordinance that violates state laws and the U.S. Constitution should be unacceptable by any city’s standards, Cozzens said. Unless specifically authorized by the Legislature by statute, a local authority or state entity may not enact, establish, or enforce any ordinance, regulation, rule, or policy pertaining to firearms that in any way inhibits or restricts the possession or use of firearms on either public or private property. However, the 14th Amendment, adopted after the Civil War, has been interpreted by the federal courts to incorporate the state and local authorities, Nay said. In both the cases of District of Columbia v. Heller and McDonald v. City of Chicago, Ill, federal courts upheld that interpretation. Cozzens said he was satisfied with the changes Bittmenn had made to address the discrepancies in the ordinance. Currently, discharging any type of firearm within city limits is against the Cedar City ordinance as stated in section 27-2. Even in a situation of self-defense, Bittmenn said, based on the ordinance, someone who discharged a weapon in the city would be in violation. There are certain allowances made in gun-free zones in Utah for gun owners who have their concealed carry permits, Nay said. During the City Council meeting, Nay offered several examples of where state law permits firearms in “gun-free” zones as reasons to address the discrepancies in the current city ordinance. Section 27a-7 of the Cedar City firearms ordinance states that, “no one shall carry or possess a firearm of any description within city limits.” This finite definition of the ordinance left it open to interpretation that concealed carry permit owners were included in the restriction. A provision in the amended version of this section allows for reasons where state law grants exception to be applicable within Cedar City’s boundaries. The language in section 3-11-1b establishes that in the time of a riot, the mayor or two City Council members may close down any area business for the safety of the community. According to the current ordinance, this includes, but is not limited to: any business that sells flammable or combustible liquids, liquor, beer, gasoline or firearms. In the new ordinance, the word “firearms” has been stricken from the section so that it does not specifically target retail outlets that sell them. However, Bittmenn said at the March 2 City Council meeting that striking “firearms” does not necessarily diminish the power of civic leaders to close said establishments if there is a riot or emergency that justifies doing so. “In general, in a time of riot, the mayor by proclamation — or if the mayor’s not here, two members of City Council — can close any business in the city,” Bittmenn said. Cozzens said that by removing the language from the ordinance, it makes it so that it doesn’t appear as though the city is specifically unfairly targeting businesses where firearms are sold. The change will make a significant difference in the city’s status as one of the freest cities in Utah, Cozzens said, but it will show that Cedar City puts in the extra effort to fix what’s broken in a timely way. Kind of interested it what happened with this article. It was here earlier today, then disappeared, and now it is back again. What’s going on??? ?